This morning I made some brown rice using the oven method. It turns out so well with this method and although it is not fast I really do not have to do anything except put it in the oven and take it out an hour later. Here is how you do it- Brown rice, oven method Spray 9 X 9 glass baking dish, set oven to 375F, in the baking dish put 1 1/2. cups brown rice, 1 tsp oil, 1 tsp salt, 2 1/3 cups of boiling water, cover tightly, bake for 1 hour. After hour is up uncover and stir rice and then recover the dish loosely for 5 minutes. Now you use it or just let it cool and then refrigerate it for use later. The vegetables I chop up are the whites of green onions, carrot, celery, and seeded jalapeñ0. Then I add the leftover meats to heat through. (Today I have a little pork, a chicken thigh, and a little smoked beef sausage.) Set aside. Scramble 2 eggs fluffy. Set aside. Add some butter to the pan and put in the rice and cook it until it is crispy on the bottom. Add back in all the vegetables, meat, and egg. Cook together briefly adding soy sauce and sesame oil to taste. Garnish with the tops of the green onions. 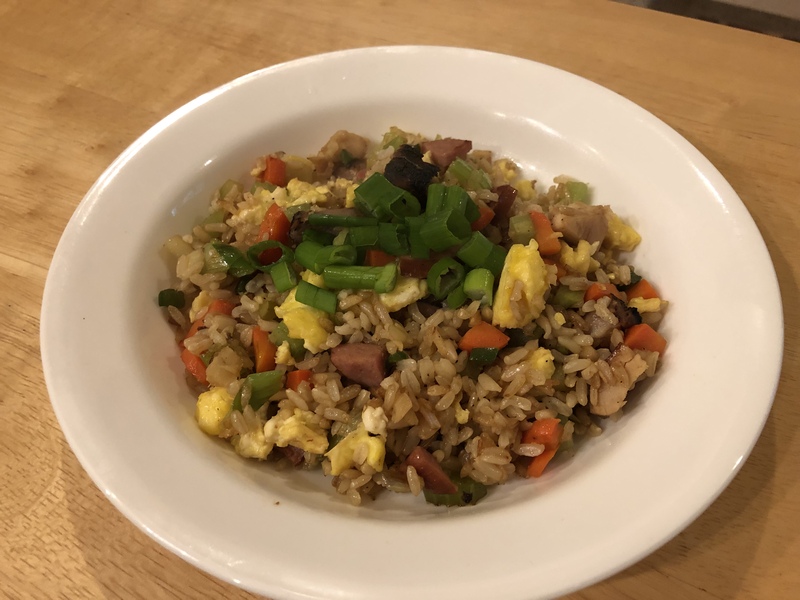 This entry was posted in Easy, Eggs, leftovers, Pork, Poultry, Recipes, rice, Vegetables and tagged brown rice, chicken, egg, Fried rice, Pork, smoked beef sausage. Bookmark the permalink.